ActivePresenter 7 gives you better experience when recording screen, editing video and designing eLearning contents. Let’s take a closer look at practical uses and features of the app in this article. ActivePresenter has a good reputation in the field of screen recording and eLearning design. With the release of this new version, the app opens up a world of possibilities for everyone. No matter what you want to create: screencasts, videos or eLearning contents, ActivePresenter 7 will satisfy you. Unlike previous versions, ActivePresenter 7 has a flat and streamlined user interface. But the great thing is that the locations of tabs stay the same. For example, the Tabbed Toolbar is still on the top. The Slides pane is on the left. And the Properties pane still lies on the right. Added to that, buttons are now arranged into named groups. With these in mind, you don’t get any trouble with ActivePresenter 7. Not just a redesigned interface, many other functions were updated and improved as well. In the remaining part of this article, I’ll show you what they are. 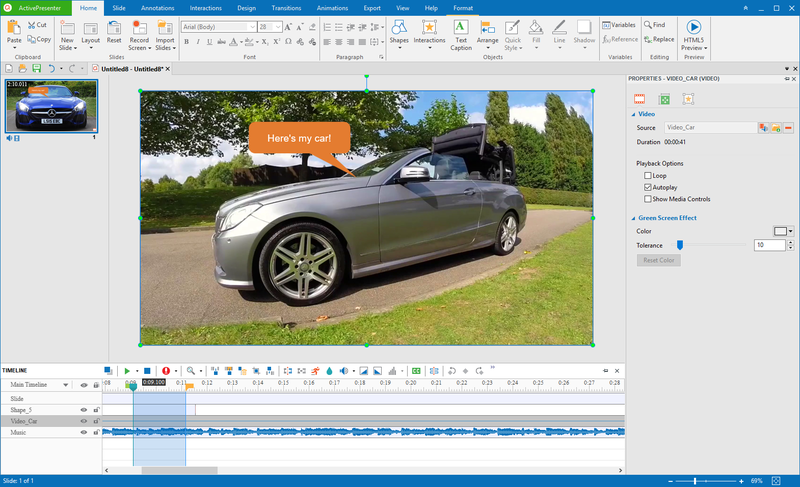 It’s simple to use ActivePresenter 7 to make a video demo or software simulation. You’re able to capture full screen/a region, record audio/voice-over/mouse movements, etc. So, the recording process virtually goes the way you want. Once finishing the capture phase, ActivePresenter 7 takes you to the editor. A simplified recording phase: The recording phase in ActivePresenter 7 is much simpler than older versions. You now have no need of choosing capture profiles. Instead, there are only two modes: record video demo and record software simulation. Hence, you find it easier to get started recording screen. Webcam recording: Do you want to include your face in your video? If so, ActivePresenter 7 is here to help you. Now you can record screen and webcam video at the same time for any purpose, even game streaming. For more information, see New Features and Enhancements for Screencasting and Video Editing. As you may notice, there’s a timeline located at the bottom. It’s where you can do almost anything you want to edit videos. For example, you can cut/copy/delete video range, change video speed, adjust volume, etc. It couldn’t be easier with all the tools you need accessible directly from the timeline. Basically, ActivePresenter 7 still has both basic and advanced video editing features. But from this version, you have a chance to experience two very new facilities. Green screen effect (aka blue screen or chroma key): It allows you to layer two images or videos together based on color hues. This technique is widely used in the weather forecast and film production, such as phantasmagorical landscapes and dragons breathing fire. Today, many educators also apply the green screen effect to eLearning design. For example, in a video, they put the speaker in front of Mount Everest while delivering the lesson. Audio Noise Reduction: Let’s say you’ve just recorded a voice narration. Unfortunately, that audio included unwanted sound. You have no idea how to fix this. But don’t worry! Let me tell you this. Just use the audio noise reduction feature in ActivePresenter 7, and your problem will disappear. You also don’t have to spend money on pro but expensive audio editors. It’s such an ultimate solution. Audio Fade In and Out: This feature is useful when you edit background music for videos. It can help smooth music and audio transitions. Basically, audio fade-ins start with silence and increase to full volume. Meanwhile, fade-outs make the volume of the video decrease to silence. 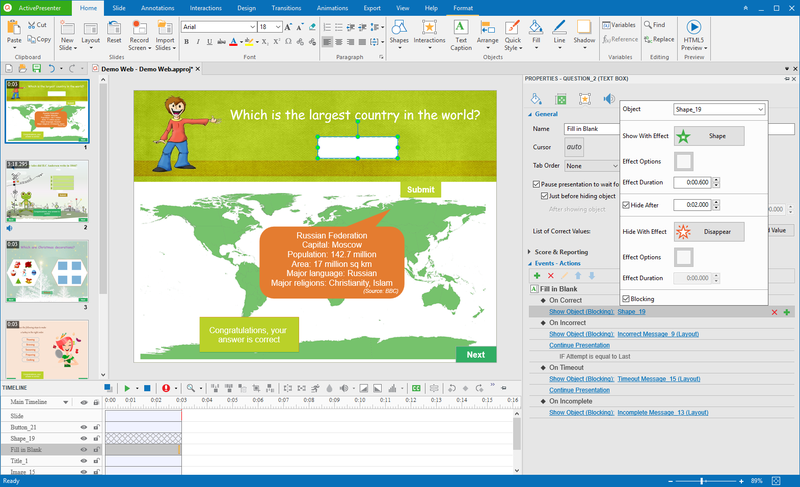 ActivePresenter is a must-have tool for teachers, educators, and eLearning designers. The app comes in handy when you design eLearning games and online quizzes. In case of making interactive simulations, choosing ActivePresenter is also an ideal choice. 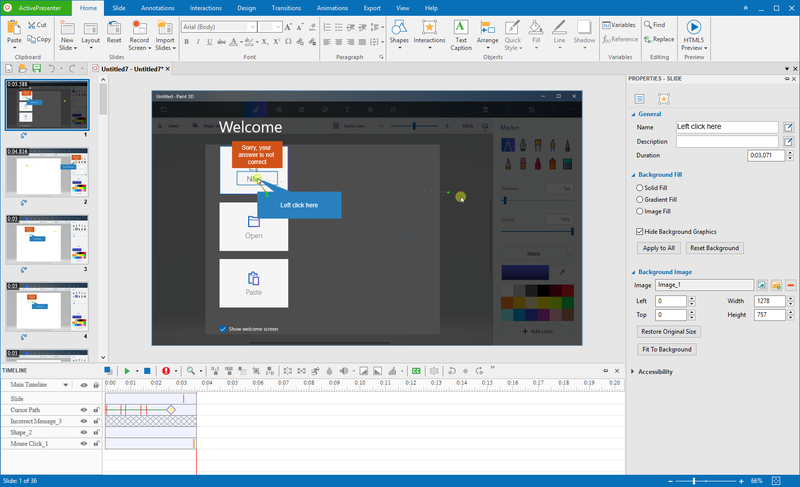 The 2017 release of ActivePresenter also rolls out exciting new features and enhancements for eLearning designers. Especially, the app comes with an enhanced event-action mechanism. Thanks to this, setting an object as an event or action is much simpler than ever. You can get things done even in a couple of minutes. Responsive design: This facility is what a lot of users have been waiting for. It lets you create contents which will be viewable on any device, including mobiles and desktops. Redesigned questions: There are still 9 types of questions. But more than that, these questions are easier to work with and contain extra customization options. Also, the ability to shuffle question answers comes to hand as well. Slide masters, themes, templates, and web fonts: All of these features will also please you. Using them is a good way to change the appearance of your presentations or eLearning courses. Object states: It’s possible to create multi-state objects in ActivePresenter 7. No need to use multiple objects to develop interactive contents. Instead, you now easily make a multi-state object with the Object States feature. This way helps unclutter the timeline of your project. Variable and conditional actions: Using variables, you have more ways to add extra functionality. Regarding sophisticated event-based interactions, ActivePresenter 7 provides you conditional actions to make them real. As an example, use a true/false variables to set up some conditional navigation. After that, the course sections learners take will rely on which radio button is selected. For more details about updates in eLearning design, see New Features and Enhancements for eLearning Authoring. That’s it! These great things are at your disposal when you work with ActivePresenter 7. So, download the app today, start creating something, and you’ll be surprised at what you get. Don’t forget to contact us if you need any help.